The Naira on Friday suffered marginal loss against the dollar at the parallel market in spite of CBN’s intervention at the foreign exchange market. 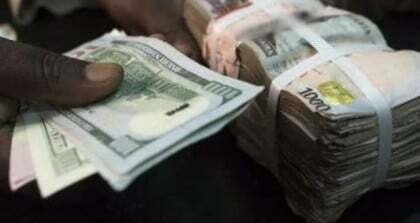 Reports say that the Naira lost one point to exchange at N366, weaker than N365 traded on Thursday, while the pound sterling and the Euro closed at N468 and N412, respectively. At the Bureau De Change (BDC) window, the Naira was sold at N363 to the dollar, while the pound sterling and the Euro exchange d at N470 and N412, respectively. Trading at the official interbank window saw the Naira closed at N306 to the dollar, while the pound sterling and the Euro traded at N396.10 and N348.50, respectively. The Nigerian currency, however, appreciated at the investors’ window as it closed at N365.02. Traders at the market expressed concern that in spite of the sustained intervention of the apex bank at the FOREX market, the Naira had hovered between N360 and N366 in the past two months. Tella noted that the CBN flooded the FOREX market with liquidity at the onset when the demand for FOREX was low, compared to now. The economist said that there was a limit to which the apex bank could intervene in order not to put pressures on the nation’s external reserve.